Integrated Reporting is the big new development in corporate reporting that everyone is talking about. Why? Quite simply, Integrated Reporting marks a paradigm shift in the way companies and other organizations think about business models and the creation of value. Integrated Reporting promotes long term thinking about value-creation and stewardship across a broad base of interdependent capitals – financial, manufactured, human, intellectual, natural, and social and relationship.With updated references and case studies to take account of the latest developments in Integrated Reporting, this book provides a practical and expert distillation of for IR professionals.Internationally renowned sustainability reporting expert and accountant Dr Carol Adams explains in simple terms what is and how to do it; how it links with other reporting frameworks and what it means in terms of thinking and processes. You'll also get a clear business case for IR and insights and best practice examples from leading integrated reporters. 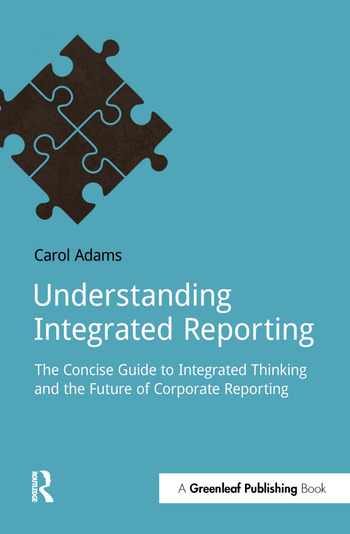 Integrated Reporting is not just for companies.This book demonstrates how integrated thinking and IR can benefit many other organizations whose success and influence depends on relationships and partnerships.